THERE ARE NO gray days in Kim Spadafora’s garden. Filled with saturated hues of tomato red, zingy citrus, and luminous berry and gold, the exuberant landscape reflects its owner’s irrepressible spirit and love for people, plants and her cherished animals. • Make room to live — and entertain. 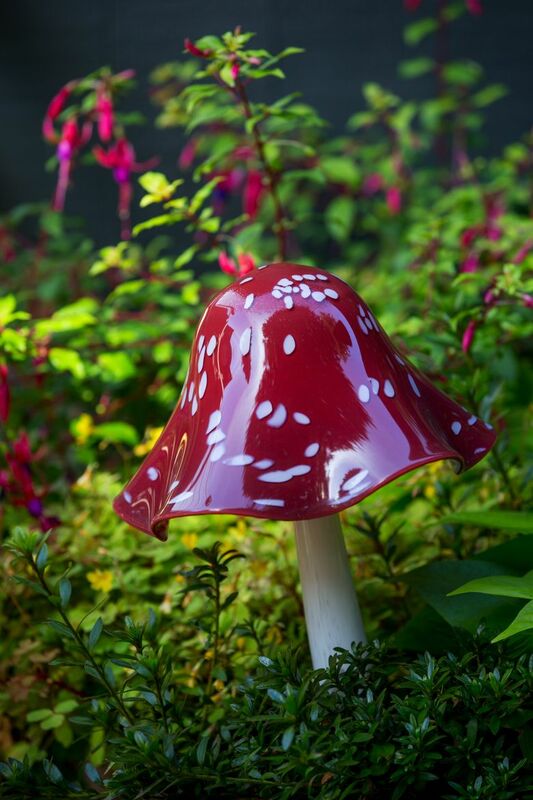 • Colorize plants and garden accessories. 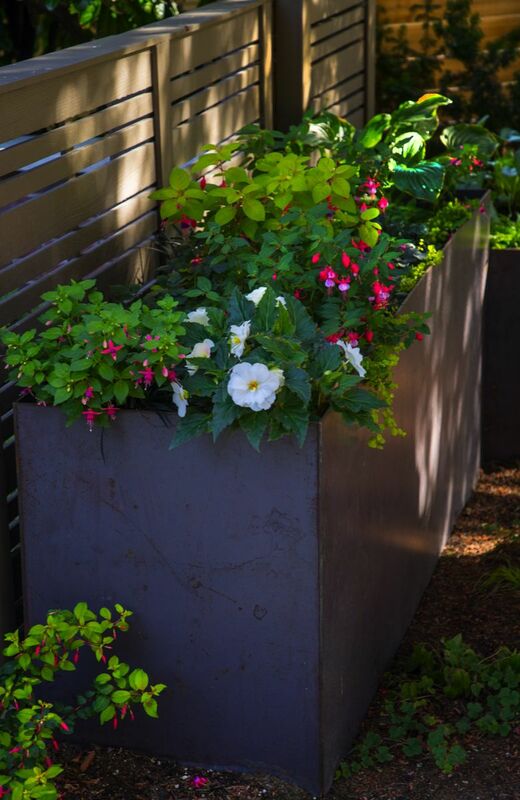 • Divide to multiply your landscape’s functionality. 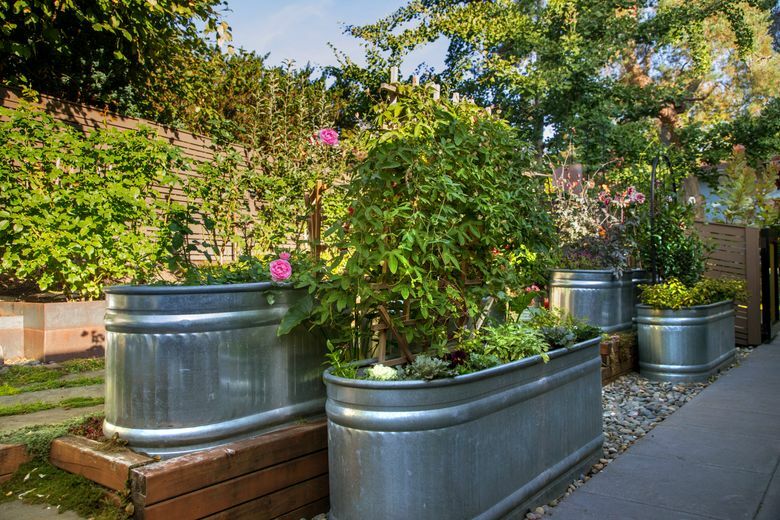 • Discover new growing spaces in overlooked areas. 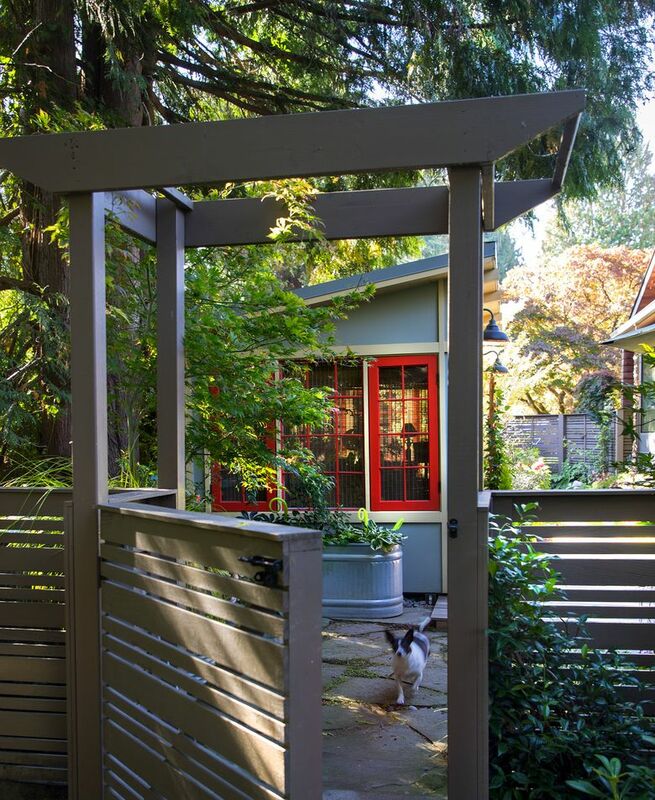 This color-drenched story began in late 2015, when Kim reached out to Seattle-based garden designer Courtney Olander for ideas about crafting a more welcoming entry garden and creating an updated, pet-friendly backyard. As so often happens with garden dreams, one thing led to another. The following six months were a creative whirlwind of reinvention that ended up transforming nearly every inch of the property. 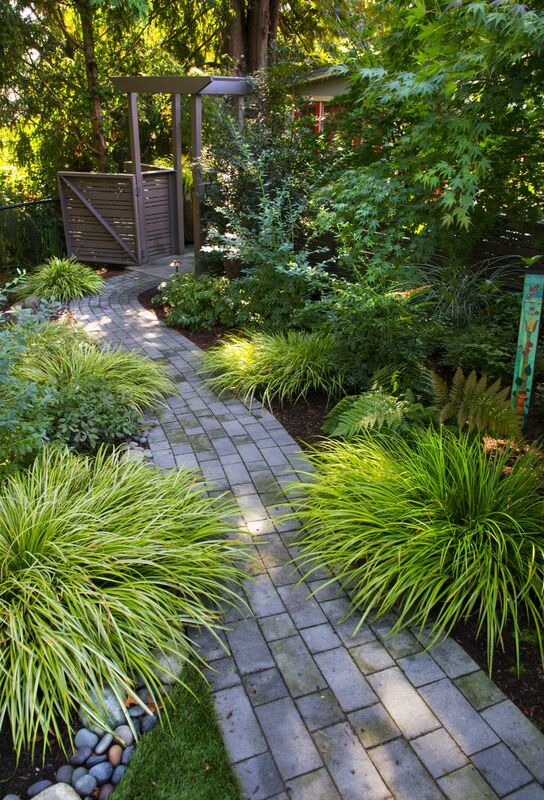 The brilliant result is a testament to the collective vision and collaboration of the homeowner, the designer and the exquisite craftsmanship of Avalon Northwest Landscape. 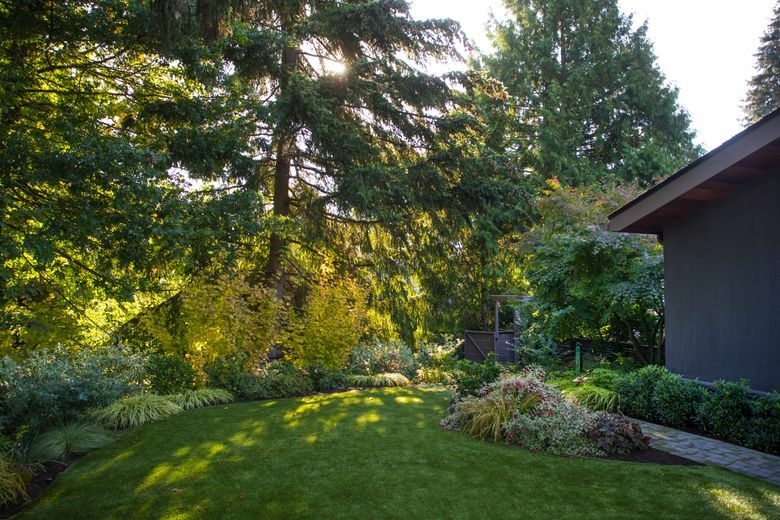 Now free of its tired and overgrown plantings, a fresh, colorful tapestry of perennials and grasses in front of a sleek modern privacy fence presents a garden-friendly face to the Windermere neighborhood. 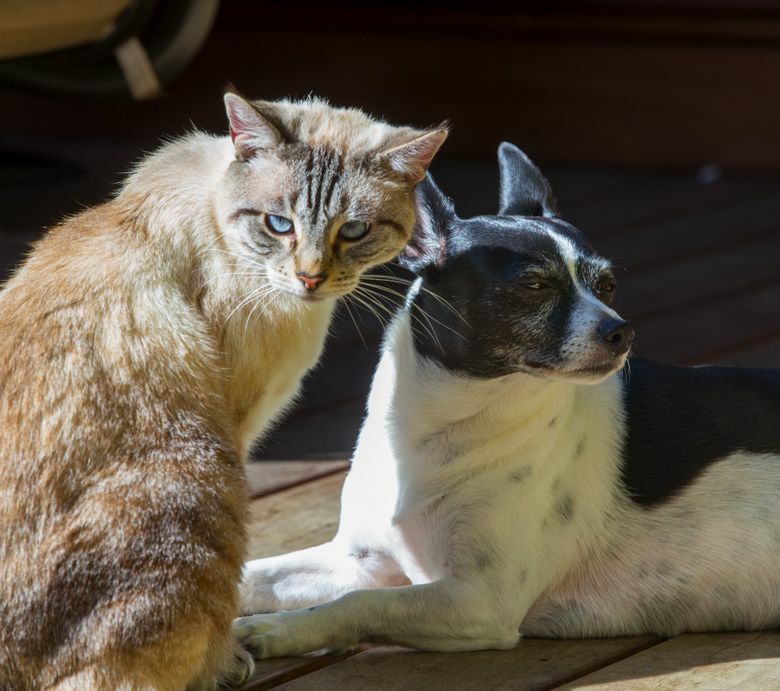 But the real magic lies just inside custom metal-framed, glowing orange and gold polycarbonate gates, where a charismatic new landscape invites gathering, puttering and play, as well as room for lounging and quiet reflection. As you enter the orange gate that opens to a generous side yard on the east side of the property — the party side — multiple seating arrangements invite you to settle in and make yourself comfortable. Large sun coverings provide daytime shade, while a warming fire pit and overhead heaters extend gatherings as day turns to evening. 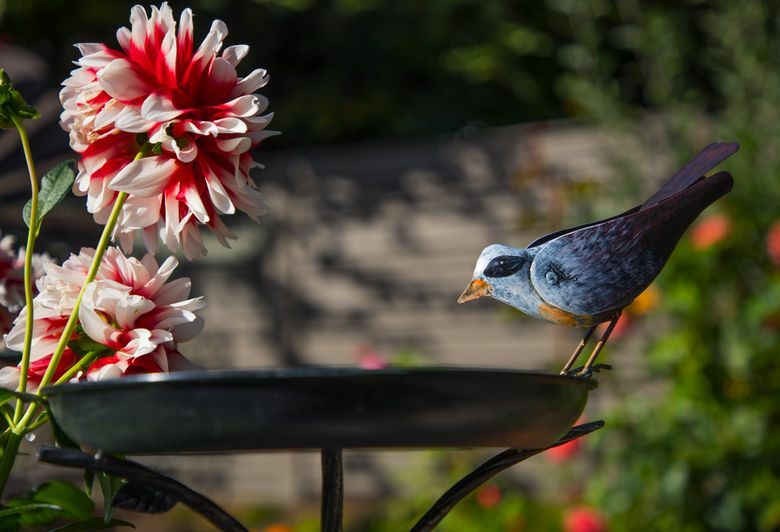 In the special equation that good garden design employs — by dividing the garden with fencing, gates, clusters of containers and an adorable shelter — Olander created more room for planting and garden features, including a small pond that is a magnet for wildlife. 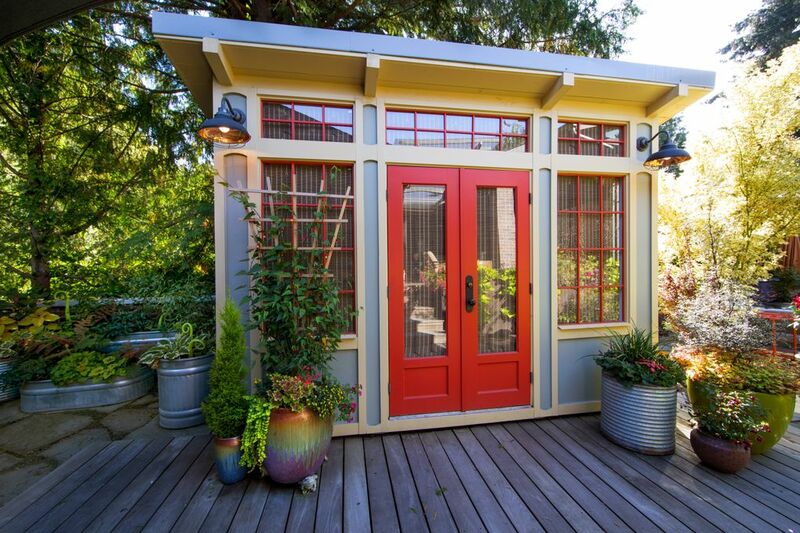 KIM’S “SHE SHED” is hospitality central all summer. A vintage refrigerator, dining table and buffet console are great for serving up delicious, bug-free al fresco meals. When not hosting summer soirees, the shelter also serves as a playroom and craft nook for Kim’s grandchildren, and provides storage during the quieter winter months. 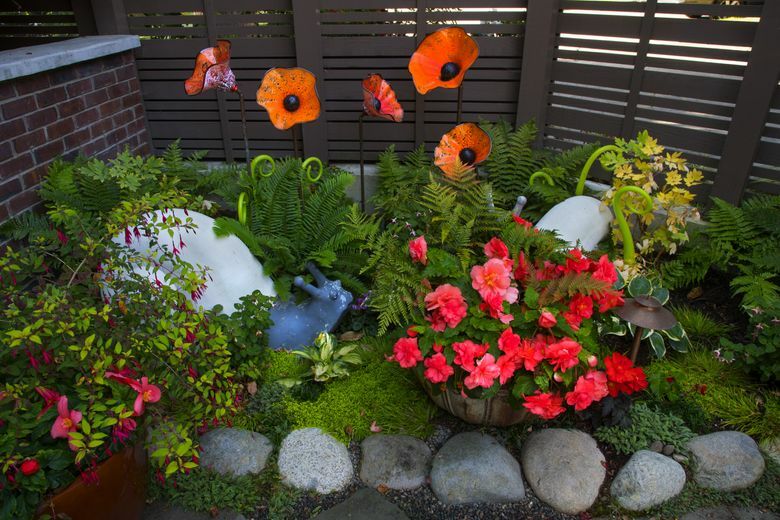 Planting beds and containers throughout the hospitable space are filled with brilliant compositions of colorful foliage and seasonal blooms complemented by Kim’s collection of whimsical garden art. 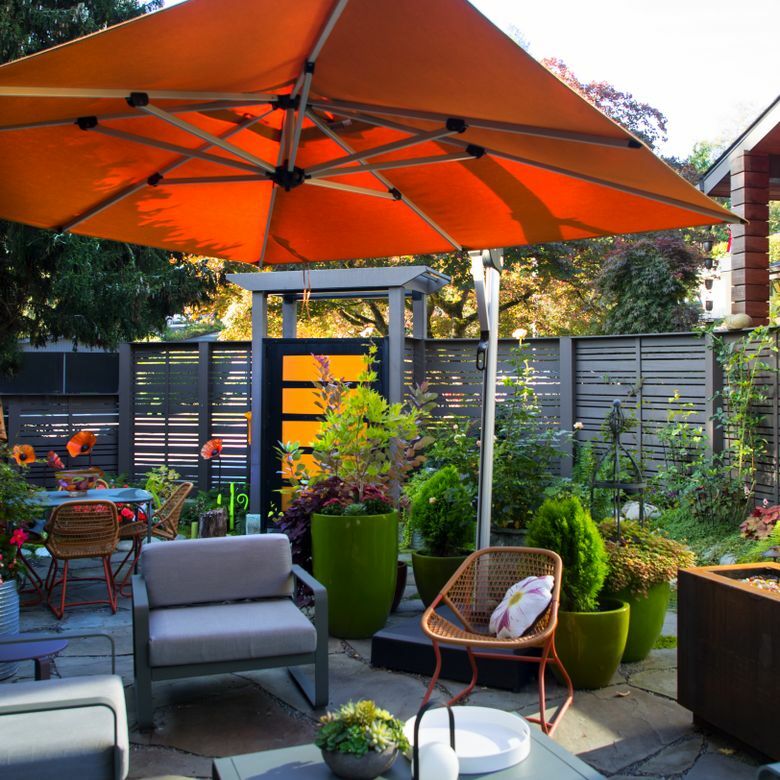 Comparatively speaking, the enclosed backyard — with its newly leveled lawn, patio space and planting beds filled with a foliage-driven, textural collage of green and gold — is a resilient, soothing space where kids and visiting pets can run and romp freely. 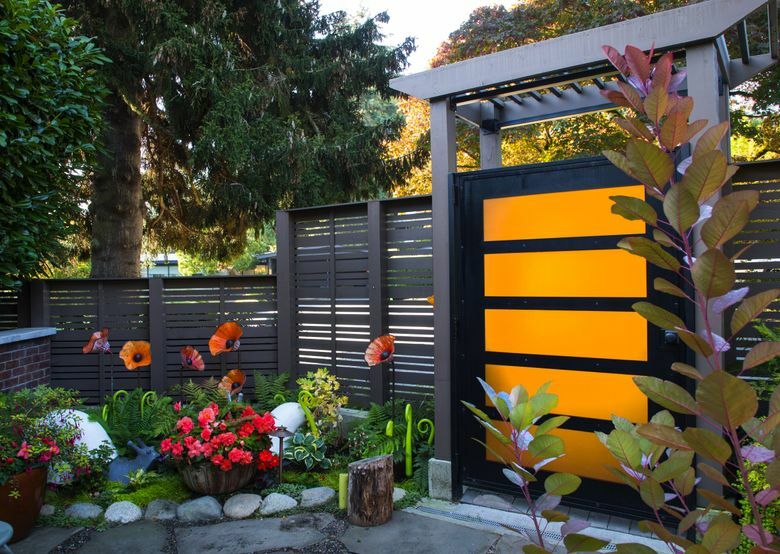 Just off the backyard, through one of the garden’s signature polycarbonate gates, this time in lemon gold, an edible garden planted in huge galvanized agricultural troughs brims with espaliered fruit trees, herbs and plentiful seasonal crops like tomatoes and fresh salad greens. 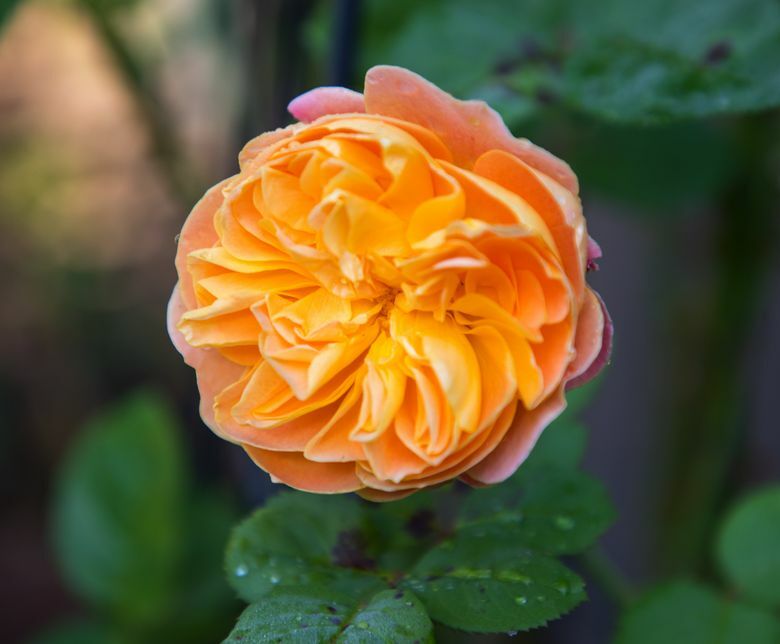 Roses, dahlias, climbing vines and blossoming annuals and perennials provide cut flowers and keep pollinators delighted. IF THE EASTERN side yard is party central, a narrow passageway along the western property line has grown into a more contemplative garden space. 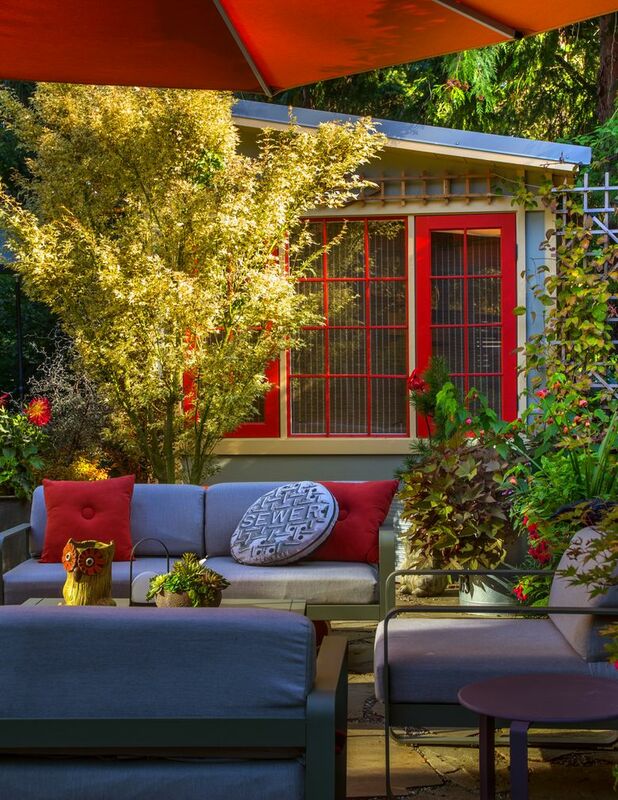 What was once an overlooked and overgrown, poorly drained side yard with a crumbling cement wall has become a personal sanctuary filled with color and artistry. A sinuous dry stacked stone wall beautifully crafted by Avalon Northwest Landscape runs the length of the terraced planting bed with just enough room for a small table and chairs where Kim can enjoy her morning coffee. Dusky charcoal-plum fencing provides a dramatic backdrop to Acer shirasawanum ‘Autumn Moon’, Heuchera ‘Berry Smoothie’, Carex oshimensis Evercolor ‘Everlime’, Fuchsia magellanica var. gacilis‘Aurea’ and other plants in the dazzling rose, wine, berry, chartreuse and gold color scheme. 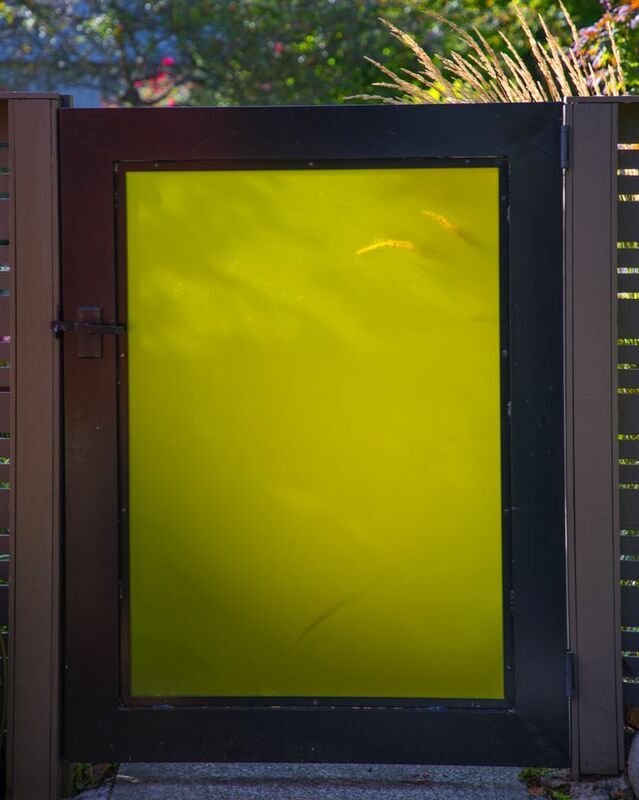 Yet another glowing yellow-paneled gate exiting the garden echoes the drama.